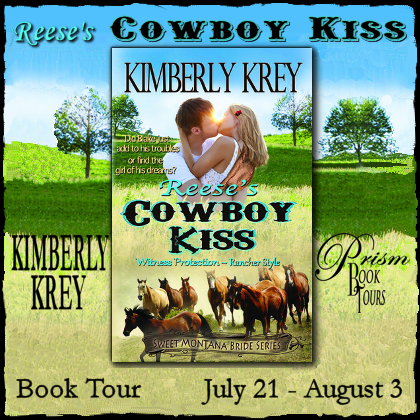 email us at PrismBookTours(at)gmail.com with "Reese's Cowboy Kiss GF" in the subject line. The Sweet Montana Bride Series by Kimberly Krey is complete at last! Reese’s Cowboy Kiss is available now on kindle or paperback. Did you get a chance to check out the tour and enter the $100 Amazon gift card? If not, go check them out now! Some of you have already read Cassie and Shane’s love story. Some have read Jade and Gavin’s tale too. Now for the first and final book of the series. That’s right – first chronologically, and final in order of release. In Reese’s Cowboy Kiss you’ll find out just how Reese and Blake’s romance begins. From that first, tender kiss to the conflict that threatens to tear them apart, their story is filled with passion, romance, and action too. As a writer, I know just what my characters look like. Sometimes I can picture a certain actor who fits the bill, other times it requires a little more thought. With Reese Taylor, it was easy. She’s a Texan pageant girl who defies the stereotype in many ways. She’s loving, kind, and looks for the best in others. While she’s beautiful and bold and loves to flirt with the guys, at twenty-four years old, Reese has never been in love. "The romance in this book is sweet and clean (with much kissing! ), and the suspense near the end of the book is very exciting. The main characters in the book are well-written and the secondary characters are good supporting cast members. The story is a quick, cute read." In the Sweet Montana Bride Series, the Emersons like to welcome newcomers with a nice, big meal. So when Reese came with a family recipe of her own, they were thrilled to serve up the savory beef brisket. In the book I refer to it as Texan BBQ, but I always had this delicious dish in mind. It is one of my favorites, and definitely worth trying at home. Yes, actually! I’ll be doing a few novellas connected to the Sweet Montana Bride Series. The first one, Rough Edges, is about Allie (the Emerson Brothers’ cousin). After her divorce, she reconnects with her ex-husband’s old high school friend, Braden Fox. Braden is a carpenter, and though he has always liked Allie, he has hard feelings about Allie picking Terrance over him. It’s called Rough Edges, and it will be about Braden’s ability to smooth out the past. "If you're looking for romance with some suspense and plenty of laughs and sizzle, then you'll definitely like Reese's Cowboy Kiss." "I loved this book and I recommend it to everyone that likes a clean romance with a dash of angst, a cupful of looming danger, and a whole lot of cowboys." "Loved this book! Romance and suspense! Well written and easy to follow. Clean little romance that you will love as well!" "This book is everything I love–clean romance, mystery, comedy–all rolled into one. And I can honestly say that this book is just a notch below my favorite." "We all know what it’s like to go out on a date only to find the chemistry isn’t quite what we hoped for. But what if our date has a different view? What if, at the end of the evening, he leans in for a goodnight kiss? In Reese’s Cowboy Kiss, Reese, our Texan bombshell, has to deal with this very dilemma when Rowdy, one of the ranch hands, asks her out. 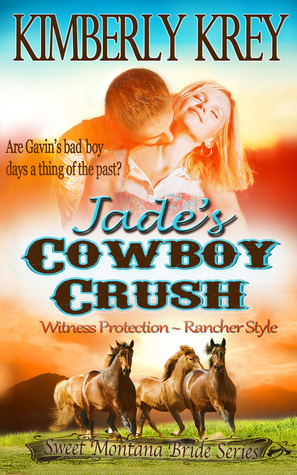 Sadly, she’s already fallen for the foreman of the ranch, Blake Emerson, so the guy doesn’t stand a chance." Relationships can be rather tricky at times. Men are often clueless as to the time and attention we women need. In novel Reese’s Cowboy Kiss, Reese realizes the truth of this when Blake, the man watching over her in witness protection, spends hours late into the night out on the land. And though the two have had a connection, he continues to leave her to either eat alone, or go against his wishes and invite the ranch hands to join her for dinner. "I loved watching the romance blossom and the suspenseful element was fantastic! I was on edge reading through those parts--very romantic and very creepy. The author did a great job in drawing me completely into the story." "I loved this book! I’m a huge sucker for a good cowboy/country/western book anyway, but Reese’s Cowboy Kiss was an absolutely amazing read!" "Kimberly Krey does an amazing job at creating a story that is fun and entertaing. Reese's personality takes the cuteness and fun factor for a female MC to a fantastic level." Texan pageant winner, Reese Taylor, has a former classmate who wants her dead. Now she must leave her friends and family to enter a protection program on Emerson Ranch. A group of good-looking cowboys awaits her, but Reese has her eye on Blake Emerson, the one man too busy with the ranch to give her a chance. Blake Emerson has no time to go lookin’ for love. He’s got a ranch to run, positions to fill, and an ache in his heart from love gone wrong. So when he agrees to harbor a witness to help on the ranch, Blake assumes his first two problems are solved. But he never dreamed his new guest would be a woman. One he was destined to lose his heart to. With sparks burning hot and danger around the bend, one question lingers in his mind: Has he only added to his list of troubles, or has Blake just found the woman of his dreams? Source: Info in the About Reese's Cowboy Kiss was from the press kit from the publicity team. If I were to go into witness protection, I'd probably pick the ranch so I could go outside. They could guard the perimeter and we could see the bad guys coming from a long way away unlike the other choices.